#NoDAPL (Dakota Access Pipeline) and “Stand with Standing Rock” have become rallying cries for the next generation of American Indians. Yes, it is about the water, “Mni Wiconi” (Water is Life), but beyond that #NoDAPL represents a notion that it is time for the voice of the Indigenous people to be heard. 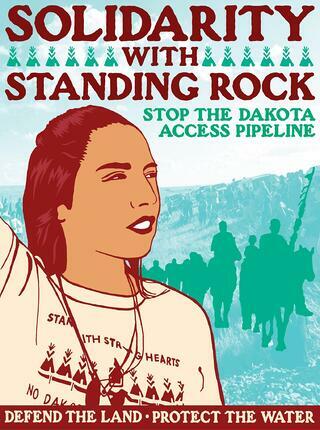 The cry has been picked up by thousands around the world; in fact, with Pope Francis weighing in and Paris Jackson giving a shout out during the Grammy Awards, it has become evident that #NoDAPL is still very much alive—in spite of President Trump’s executive order for Energy Transfer Partners to resume construction on the last section of the 1,172 mile pipeline that will carry fracked, crude oil from North Dakota across five states to Illinois. With this latest executive order, learning about the young people behind the cry #NoDAPL seems imperative. What does it take to start a movement? One voice. Then another. And another. Soon there is an avalanche of voices that are heard ‘round the world. Oh, and having Facebook, Twitter, and Snapchat helps, too! This is how Bobbi Jean Three Legs, Standing Rock Sioux Tribe (Hunkpapa Oyate), first thought about the idea of protesting the pipeline. Around this same time, Bobbi Jean’s relative called her and told her more about the pipeline. She explained to Bobbi Jean what DAPL would mean for Standing Rock and what it could do for the future of the tribe. Immediately, Bobbi Jean thought about her daughter, Chloe, and the youth basketball players with whom she worked. An elder gave a blessing and a talk in Lakota that Bobbi Jean’s father translated for the youth. He said the elder asked, “Do you understand what you are about to start?” Next, the elder explained that the water was sacred and its own being, and he said, “If you do this, it will follow you wherever you go.” Then, he prayed for them before and after the first 11.1 mile run which was along the Missouri River from Wakpala to Mobridge, South Dakota. A week later, a group of the Keystone XL Pipeline fighters from the Cheyenne River Reservation came to Wakpala where they met some members of Hunkpapa Oyate. They suggested that a camp should be established for those interested in stopping the DAPL. It was then that LaDonna Brave Bull Allard, Hunkpapa elder and historian, offered her land where the Cannonball River joins the Missouri River, for what would soon become the Sacred Stone Camp. Originally, the Sacred Stone Camp was to be a small prayer camp with only three or four people staying. In order to support the effort, Bobbi Jean and Chris Walton, her boyfriend, joined the camp in its third or fourth week. It was then that LaDonna asked her to help lead and organize a 500-mile run from Cannon Ball, North Dakota, to Omaha, Nebraska. Bobbi Jean teamed up with other coordinators like Joseph White Eyes and Jasilyn Charger of Cheyenne River Sioux Tribe to plan the run. Twelve runners completed the run in about eight days. “Literally, everyone I asked to go either thought I was crazy, or they were too busy,” she laughs. 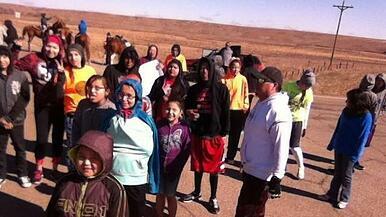 Out of the twelve runners, five or six of them were youth from Standing Rock who just jumped in, dropping everything. She met so many unique people along the way. 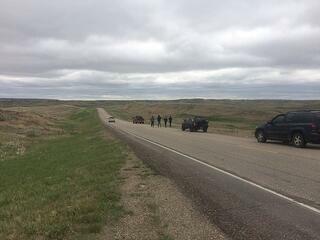 In Winnebago, Nebraska, a Lala (grandpa) with a cane wanted to run with the group but couldn’t. Bobbi Jean took the privilege of walking four miles with him. According to her, it was the best conversation she had ever had in her life. He said, “You know, there are going to be a lot of people who aren’t going to agree with you, but that’s okay. When people look at you guys and know that you are running, that will make them uncomfortable. And when you guys make yourselves uncomfortable, then you are making us [people] think about it." This really put the group’s effort to raise awareness into perspective for this young mother and warrior. The group made it to the steps of the U.S. Army Corps of Engineers' office in Omaha on May 3 where a representative accepted their petition to deny the easement to drill under Lake Oahe (a dammed section of the Missouri River, the fourth largest reservoir in the United States). 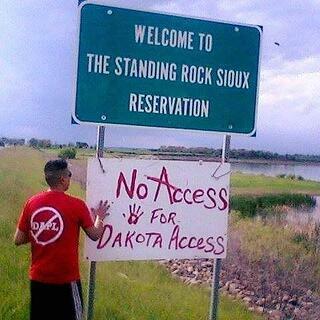 Feeling empowered and motivated, the group returned to Standing Rock and the Sacred Stone Camp. This is just the beginning of the story...read part 2 here! At Native Hope, we believe in honoring American Indians and their culture with a message of hope and dignity.